The entire island of Lanzarote is a UNESCO biosphere reserve, and it contains no less than 13 ‘protected areas’ including a Spanish National Park – Timanfaya, where Raquel Welch was memorably filmed in ‘One Million Years BC’. As your base we have chosen Playa Blanca, a quieter resort in the extreme south of the island, close to the Papagayo nature reserve. 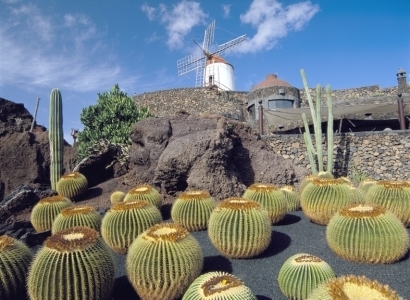 The artist Cesar Manrique left an indelible mark on the island, not just in the artistic heritage, but in his (and his followers’) dedication to maintaining the unique landscapes of his island and opposition to tasteless over-development. As you explore Lanzarote, you will see that hi-rise building has been avoided, that the traditional rural architecture with its white buildings and striking green paintwork has been respected, and above all that the island’s extraordinary landscapes have remained unblemished. Day One: Flight to Lanzarote, transfer to your hotel for seven nights half board accommodation. Days Two to Seven: In Playa Blanca, with three included walking excursions, one to the neighbouring island of Fuerteventura and two within Lanzarote. Playa Blanca: our chosen resort of Playa Blanca is quieter than most of the island’s resorts, yet has every amenity. A particular feature is the long promenade, which runs close to the harbour, passes the stunning new upmarket development of Marina Rubicon and continues out towards Papagayo. There are good island bus services, allowing you to get around by public transport if you wish. Walk 1: Southern Lanzarote. La Geria’s unusual vineyards and the Natural Park of the Volcanoes. Coach transfer to the village of La Asomada (25 minutes), from where you walk on Mount Gaida, with superb views over the island. Your route takes you through vineyards; the vines are cultivated here in an apparently inhospitable postvolcanic environment. Entering the Natural Park area, you climb onto the Caldera called Cuervo, for views into the crater but also across the island. 5 miles, ascent/descent of 280m. Walk 2: Fuerteventura. You walk to the port (10 minutes) to catch the ferry to Corralejo, Fuerteventura (35 minute crossing). On arrival you join your coach and head for the island’s old capital, Betancuria, which takes its name from the first Spanish settler, Jean de Bethencourt, in 1405. You will have time to explore the white-painted village before you start your 4 mile walk, which takes you along the spine of the island, with great views all around. Your destination is Vega de Rio Palmas – the ‘Meadow of Palms River’, where the apparently dry watercourse does indeed provide water for the palm trees. You have time for refreshment too(! ), before you rejoin your coach to head for the Corralejo Dunes Natural Area. There you walk a further mile or so to explore the dunes – in fact an outcrop of the Sahara Desert, set by an azure sea and again rich in birdlife. You return to the port for the ferry back to Playa Blanca, arriving in time for dinner. 5 miles with mainly decsents of 200m. Walk 3: Northern Lanzarote – Corona Volcano to the Crags of Famara. Coach transfer to the Corona Volcano (45 minutes), Lanzarote’s highest. Your walk takes you up this volcano and then across to the cliffs at Famara, from where there are excellent views of the Chinijo archipelago. 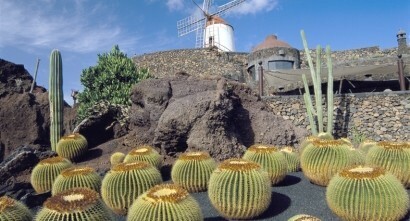 Along the way you will discover some of the unusual flora of this area, which has more water than the rest of Lanzarote. 7 miles, 550m of ascent/descent. A fourth, optional, walking excursion to the north of the island and La Graciosa island may also be available. Located in Playa Blanca just a short walk to the promenade, the hotel has been recently refurbished. It has two restaurants, two bars and a coffee bar. There are two swimming pools, minigolf and tennis court. Free wifi in the lobby. Bedrooms have bath, hairdryer, terrace or balcony, fridge and flat screen tv. Standard rooms have garden or mountain view; superior rooms with pool or sea view are available at a supplement.